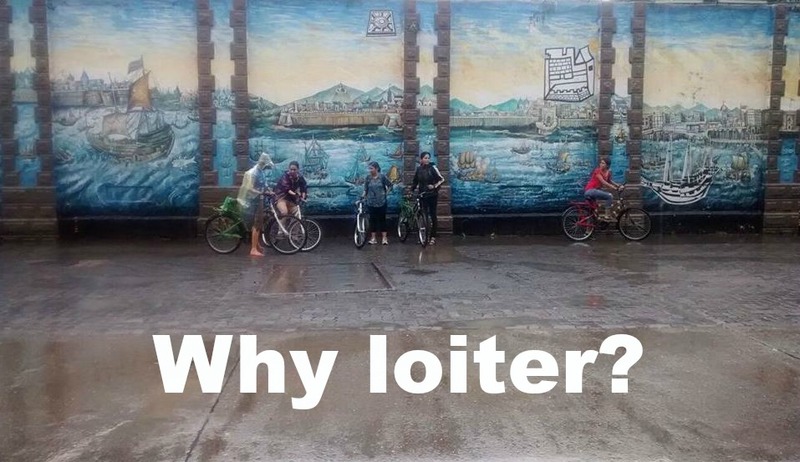 Why loiter? the movement, is now in its third year of existence and the one thing (among many other things) that I have learnt from doing it for more than two years, repeatedly, is the importance of repetition. Not to take away from events and mass protests or their importance in making people get up and take notice, expedite the judicial process or just to vent anger and frustration over incidents of gender based violence. Such large scale protests, events and walks are essential to keep reminding those in power that we care and we are not happy. The sustainability of Why loiter?, however, is a miracle in this fast paced lives of ours. When Devina and I first took our tiny step of rebellion on a Sunday morning in May, 2014, we had absolutely no idea that we were onto something much bigger than ourselves or our ideas. We didnt even do it for something bigger, one day. We went to a park with our mats and our music, for just that pleasure of being in a park, on a Sunday morning, exercising our right to be there, and gleefully taking selfies, like any other regular person. What was irregular was, however, our politics. What was unique was, that we knew that our bodies on the grass that morning meant a lot more than our bodies on the grass that morning. We continued loitering not because it was going to become bigger and we were going to be featured in newspapers and TV shows and we were going to become famous , but just because it was so much fun. We continued loitering because it came from a sense of pleasure, fun, being proactive and with a very political vision. I cannot emphasize enough the value of sustainability, in not just changing the world, normalising things, but changing yourself, really. Doing something over a sustained period of time helps you discover your own fears, your own politics and your experiences lead to a braver, more articulate and assured individual. Mass protests that last a few hours dont do that. A lot of women call me after incidents of sexual violence and ask me to participate in protests they are organising and my question to them, always is, yes sure, but do you have a plan for after that? A lot of people feel bogged down by the largeness of the issue of gender inequality and feel that just a bunch of women loitering wont solve anything. I agree. But we didnt start loitering to change the world, we started loitering to change ourselves and to have fun. and look what all has happened in the last two and a half years. There are loitering groups coming up in several cities across India, and Pakistan. There are people writing about it, making films, plays, talks, lectures, workshops, and more, across the world. Students are writing papers, making presentations and writing PhDs about it. The authors of the book, the people from the various chapters in cities, the people who do the play 'Loitering' have all become friends. But most importantly, women are getting inspired to just loiter, to just have fun, and have stopped taking 'no' for an answer from families and guardians. This is a lot more than we could have ever imagined our first little loitering steps would do. Sustainability, repetition, consistency has become of a much greater value to me than ever before, and is the key to normalizing a gender equal world. In other news ... I'm a male who was intrigued by "Why Loiter" following an introduction to it via a radio program I happened upon while out driving. I was particularly drawn to the unspoken dynamic of women "moving from point A to point B" because of the dominance of men and the "fear in the women." Being one who despises anyone having to live in fear and to alter their lives as a result of it, the idea behind "Why Loiter" really resonated with me, enough that I will dig deeper into it and "spread the word" so others can give serious thought to it and hopefully respond/act in a freeing way, particularly women but even others who may suffer the debilitating effects of fear imposed by outdated and backward societal norms and culture. Keep up the good -- great -- work! The fear in women from moving from point A to point B is not so much because of male presence, but because of patriarchy, where women are conditioned to be submissive, fearful and weak and men are conditioned to be aggressive, angry and impulsive. Do spread the word. I am surprised you heard of us on radio!! Anyway, thank you again.